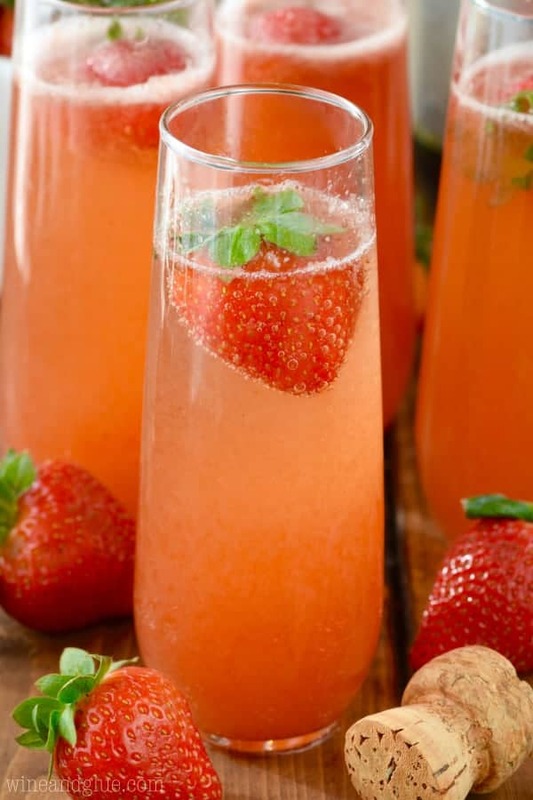 These Strawberry Bellinis are such perfect champagne cocktail for parties or brunch! I’m so excited to share a special cocktail with you guys today!! You guys. Hold the phones because this is very likely my last post of 2016! I’m not going to guarantee that because if I have a few extra minutes to squeak something out for you, you know I’m going to. And you know that I love me a good wrap up post, so I might give you my favorites and your favorites of 2016 in posts next week . . . do you love how I’m already back pedaling? Lol! So originally a bellini was a champagne cocktail that combined champagne with peach nectar. This is just like that, only I made mine with strawberry syrup. YUM! The strawberry syrup is really easy to make, and I love the idea of just setting it out in a pretty dressing container (pssst, I found mine for a $1 at GoodWill! You can see a better picture of it here) with a bottle of champagne and let people just have at it at a party. It takes very little effort. 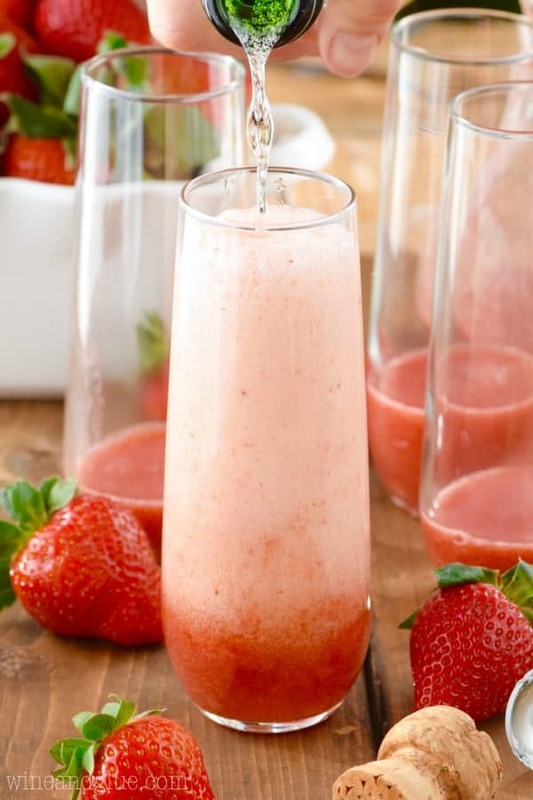 So full disclosure, if you want this cocktail to be extra pretty, you are going to want to use a cheese cloth to strain the strawberry syrup so you remove every last fiber and seed. Or you can also pull out the strawberries once you get a nice syrup going, and skip the blending step. But! I’m a lazy baker, lazy chef, and even a lazy bartender, plus I like the extra strawberry punch. So I left the strawberries in, blended them up, strained them through a mesh strainer and then savored these cocktails. Seriously so yummy. Happy Holidays, Merry Christmas, Happy New Years, Happy EVERYTHING, friends! I am beyond grateful for your support this year. You all made 2016 a year for the books, friends. From the very bottom of my heart, I thank you all so much for your support and making this year so amazing. For TWO MORE AWESOME Bellini Recipes be sure to stop by Dorthy and Cathy’s places! Combine the strawberries, water, and sugar in a medium saucepan over low heat. Bring to a boil. 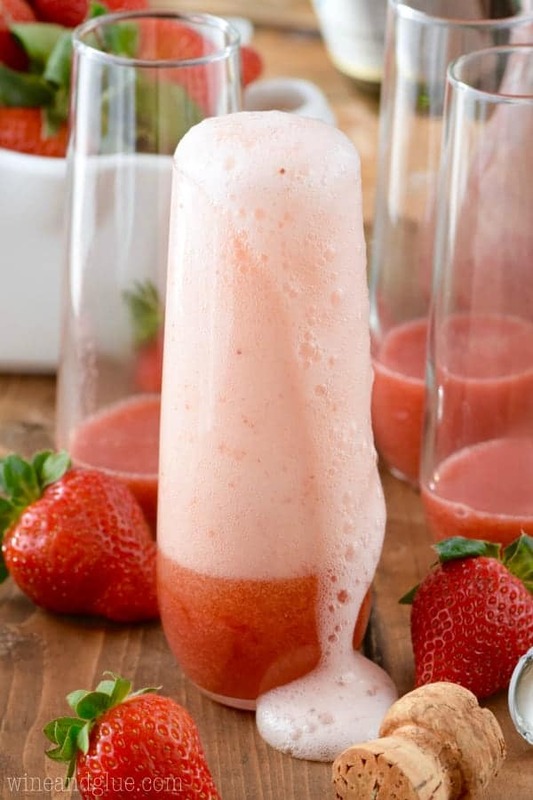 To make a clearer syrup, remove the strawberries, and allow the syrup to cool completely. Otherwise, break up the strawberries with a fork and allow the syrup to boil for about three minutes over low heat, stirring often. Transfer to a blender, blend, and strain through a mesh strainer. For a cleaner syrup, strain through a cheese cloth. Allow the syrup to cool completely. To do this faster, transfer to a mason jar, fill a large bowl with ice, and put the mason jar in the bowl with top open, rim above the ice. 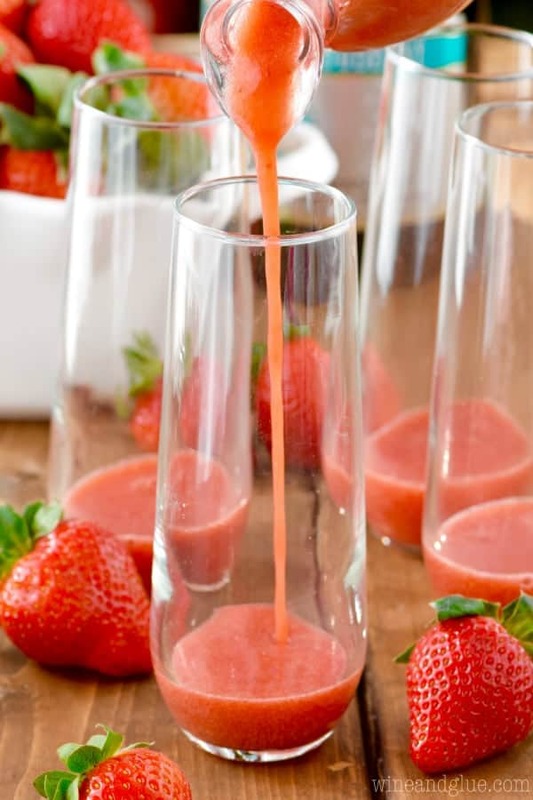 Pour a small amount of strawberry syrup (once cooled) in the bottom of a champagne flute and fill with champagne. I want this NOW! Looks awesome and all that foam and fizz…beautiful pics and you’re making me very thirsty! Thanks Averie!! I don’t love all my photos, but I love these ones 🙂 And bellinis at 10 on a weekday doesn’t hurt, lol! Thanks for sharing this, I am a fan of cocktail drinks and this really is amazing, I love the glass by the way!! Where did you get that? Hi! Thanks for this recipe! Could I make it a day ahead and leave it in the fridge? You can make the syrup ahead of time, but obviously you want to wait to mix it with the champagne until right before serving. Both! Make the syrup and then you can make just one, or you can about a quarter cup to a pitcher and add the champagne, adding more syrup to each glass depending on how people like their cocktails.